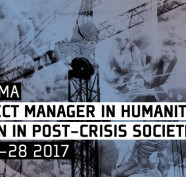 – use the essential tools of project management in humanitarian action, namely health indicators, human resources and fundraising, and intercultural awareness. This part deals with the methodologies, such as health basic indicators, essential legal tools, human resources and basic financial skills (fundraising), and logistics in situations of disaster or humanitarian mission. Konowledge of the areas of intervention, to better understand the dynamics, issues and humanitarian organizations.